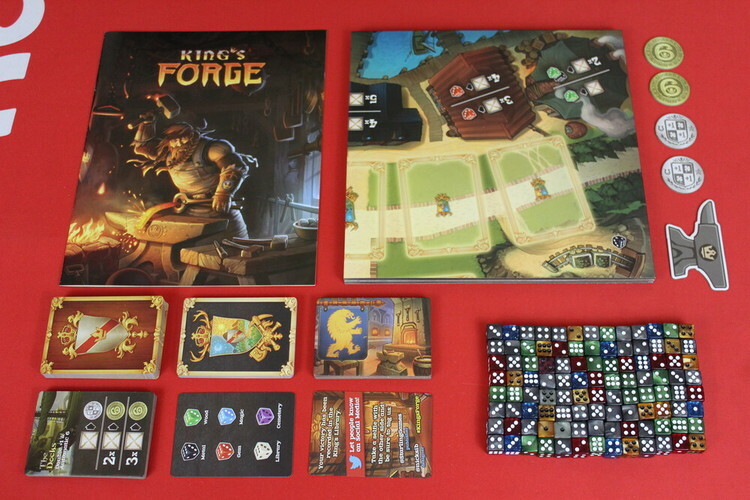 King's Forge is a 2-4 player pool building, dice rolling, drafting game. Use your dice to draft and activate cards then any dice remaining can be rolled in an attempt to craft items. Place the game board in the centre of the table. Each player takes five black dice and a smithy tile, choosing which side up they wish to have it. This then shows their shops mascot for the game. Place the rest of the dice on the appropriately marked spots on the main game board. Shuffle the craft cards and randomly draw the appropriate number for the number of players - with two players use nine, three players use ten and four players use thirteen cards. Put the rest back in the box as you will not be using them. Sort the selected craft cards in order from low to high based on the number in the top right of the cards. 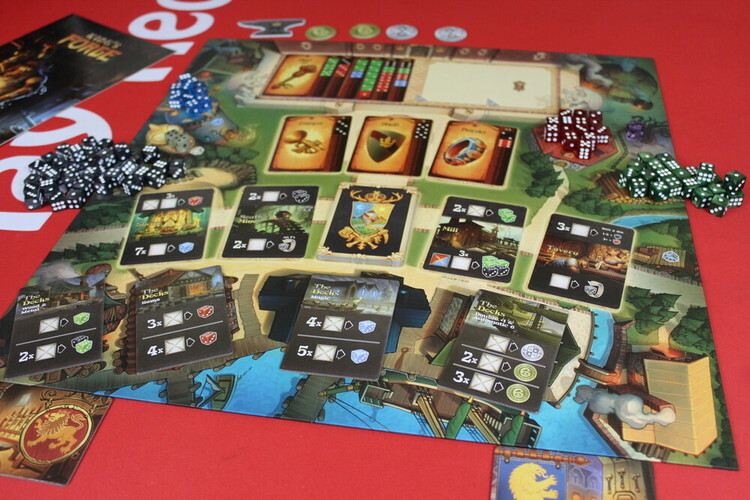 Place the three lowest ranked cards on the space on the board and the rest above them, in rank order but splayed out so the icons on the right-hand side are visible. Look through the gather cards to find the ones marked with an anvil symbol - North Mine, South Mine, East Forest and West Forest. These cards will be used in every game. Shuffle up the rest and draw seven at random. Add these to the other four and shuffle the deck of eleven cards, place this on the spot on the board underneath the crafting cards. Put the rest in the box as they will not be used. Give the anvil token to the start player and you are ready to go! Each round consists of three phases, players will take it in turns to complete each phase then move onto the next. Once all players have completed the cleanup phase the round ends, the start player anvil moves to the player on the left and a new round begins. 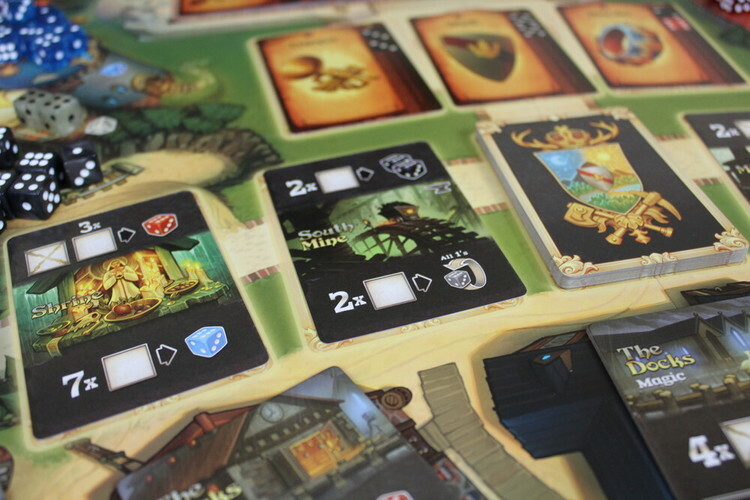 The start player deals four gather cards into the centre of the board and may then choose one of three actions. Claim a gather card. To do this, they must have the number and types of dice shown on the card to do one of the two actions. Move the card in front of you and place the necessary dice from your supply onto the card. Only one of the actions shown on the card is available to you and those dice may now not be used for the rest of the turn. If the chosen action grants you additional dice, these dice are moved from the supply onto your smithy tile and may not be used for this current round. Resources are finite in the game so if you go to claim a dice and there are none available, take any that are available only, you may not come back later and claim what you couldn’t at the time. If the gather deck has not yet been exhausted, turn over the top card and immediately fill any spaces when cards are taken. Visit a Dock Location. To visit a dock location, you must take a gather card from the centre of the board and place it face down in front of you. If there are no gather cards available, you may not take a dock action. Select an unclaimed dock action and place the required dice from your pool on that action. All of the dock actions are available to all players, however, if an action has been taken, the same action may not be performed by another player. All areas have two action spaces, one is cheaper than the other so if a player has already taken the cheaper spot, you must pay for the more expensive version of that action. Tokens received from the dock must be used the same turn they are taken and cannot be carried over into subsequent rounds. Pass. If you decide you do not wish to take any more actions and keep the rest of your dice for the craft phase, you may pass. If you are the first player to pass you may either take one metal dice or one of the +1/-1 tokens for use in this rounds crafting phase. The gather phase ends when either all players have passed or else there are no more face-up gather cards left available. Beginning with the start player and advancing clockwise, every player has the chance to craft any one item from the three currently on display, or to steal any item that was crafted by another player previously in this round. Roll any unused dice you have from this round. You craft an item by matching your dice by colour and value to the requirements on one of the three craft cards on display. Don’t forget - this is the time to use any card actions or tokens that manipulate your dice! Dice can be raised above a value of six during this phase. The value of the dice must meet the requirements and can exceed them. Place the card and allocated dice in front of you, you have successfully crafted this item! However, you cannot actually claim the card until the end of the phase. As soon as one of the display cards is crafted, move down the lowest value craft card from the display, this is now available to craft this round. 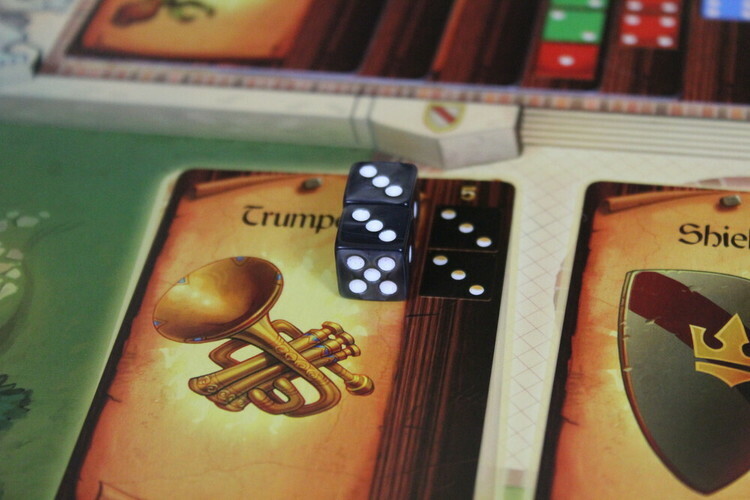 If you have enough dice and are lucky enough with your rolls, you may craft multiple items in a turn. When you have no more dice left that can be used to craft, place any remaining dice on your smithy tile and your crafting phase is over. Even if you have completed a craft card you are not guaranteed to complete it, other players may steal it later in the round! To steal a craft card you must be able to allocate dice that are all equal in value, but at least one dice must be a higher value. If you successfully steal a craft card from another player, move that players dice onto their smithy card and place the card and dice in front of you. Remember though, this item is still not safe as someone else could steal it from you in their crafting phase! It is possible that you will enter the craft phase with no available dice or that you roll and you are unable to craft any of the available items. If this is the case, your craft phase is over and you must pass. Once all players have either passed or taken a craft turn, this phase ends and the cleanup phase begins. If you managed to complete and keep a craft card throughout the craft phase, now is the time to claim it! 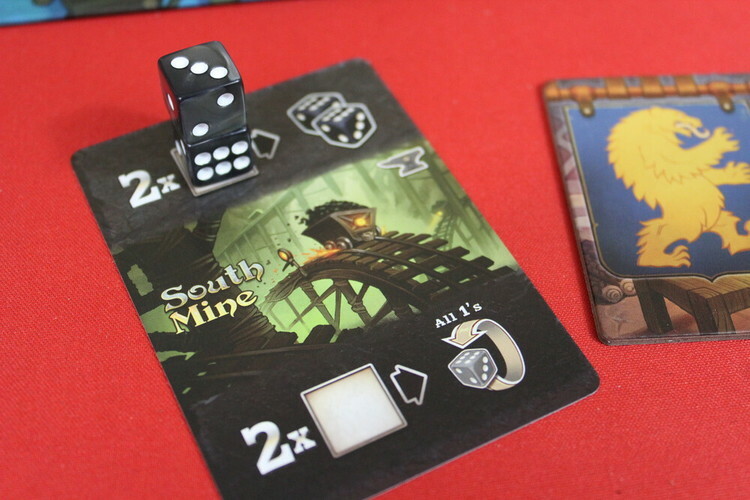 Move the dice from it back onto your smithy tile and tuck the card under your tile with an edge showing so other players can keep count of how many you have. This card now cannot be stolen from you. All dice on dock spaces and gather cards marked with an X are discarded and put back into the supply. All players dice are placed onto their smithy tile. Pass the first player anvil to the left. That player takes all eleven gather cards, shuffles them and places the deck face down on the board ready for a new round to begin. The game ends in the round a player has crafted their fourth craft card. The player with the most crafted items is the winner! In the case of a tie, the player with the highest number craft card wins. 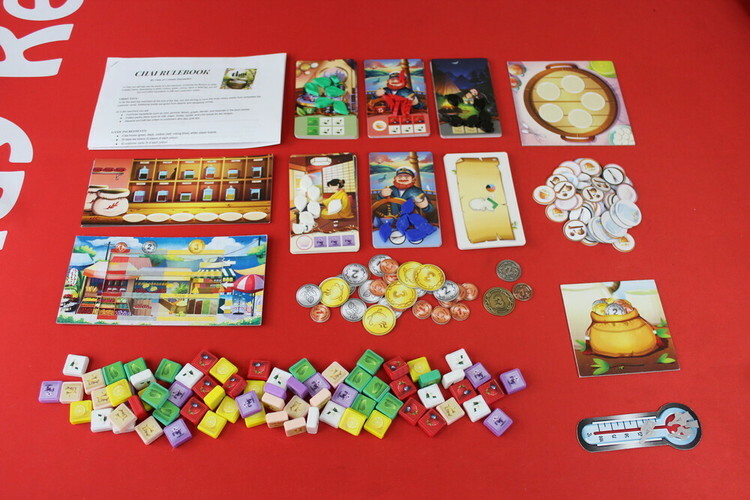 Our review copy also came with the ‘Gold’ expansion. This not only adds an extra resource - d’uh gold obviously, but a load more craft cards, gather cards and introduces the Queens Favour. There is also a lot more modular rules and scenarios to change up game play. At heart, Kings Forge is a bagless bag builder. The choices of when and where to use your dice make for interesting game play and mean you never really end up with the wrong dice as there’s always a way to use them and you always know what items need crafting next meaning you can always be prepared. The dice themselves are pretty and great quality making it fun to roll a handful of them. As well as the Gold expansion there are four other expansions adding a ton more content and variations to the game, meaning it will never be samey!